In the local supermarket in the old town in San Cristobal, the toothpaste is kept in a locked cabinet. There are other, more expensive things that are not locked away – but toothpaste is obviously a highly sought after, often shop lifted item. I had to ask the cashier to get it for me! We spent a bit of time yesterday and today wandering around a market that is a few blocks from the main square. It mainly had Mayan handcrafts including woven tablecloths / table runners, embroidered shirts, leather goods, pottery etc… it was nice just browsing – and some of the woven linens were just incredible. So incredible, that we had to buy a couple of things!! Which is actually a bigger deal than you might think… we’ve got no space for any additional items on the bike, so any purchase has to be sent home before we move to the next town. And even finding the post office can be a task in and of itself! We wandered into a DHL first – and high tailed it out of there as soon as we’d recovered from the shock of sending one table cloth and three table runners from Mexico to Australia. Wow – so expensive! Instead, we armed ourselves with directions to the local post office… and managed to find it… only to discover that Mexican post offices do not sell boxes, postage bags or any of the things required to actually mail a parcel – other than stamps. Luckily, the guy there was very helpful and found and old box for us which he cut down to size. He also wrote Adrian a little shopping list of things required to actually package the parcel including a roll of sticky tape and some packing paper and sent him off to the paper store around the corner. Although the package was only 2kgs, the postage cost twice as much as the items themselves… I suspect that’ll be our first and last shop for quite a while. We contemplated spending an extra night in San Cristobal – and then agreed that actually it’d be nice to see another town in the state of Chiapas, the southernmost state in Mexico and definitely my favourite. As we left town, it started to rain – and it rained pretty much the whole way to Comitan. Our weather gear held up though – so although it was tough riding (pot holes, mud, rain drops on visor, helmet fogging up) – we were dry, and it was only 100km. Only 100kms… and the relatively short ride ended with the best sushi I’ve had… ever! There was a Mexican-Japanese fusion restaurant a few doors down from our hotel and it was fantastic. So good, that we ended up eating there for both a late lunch, and dinner. 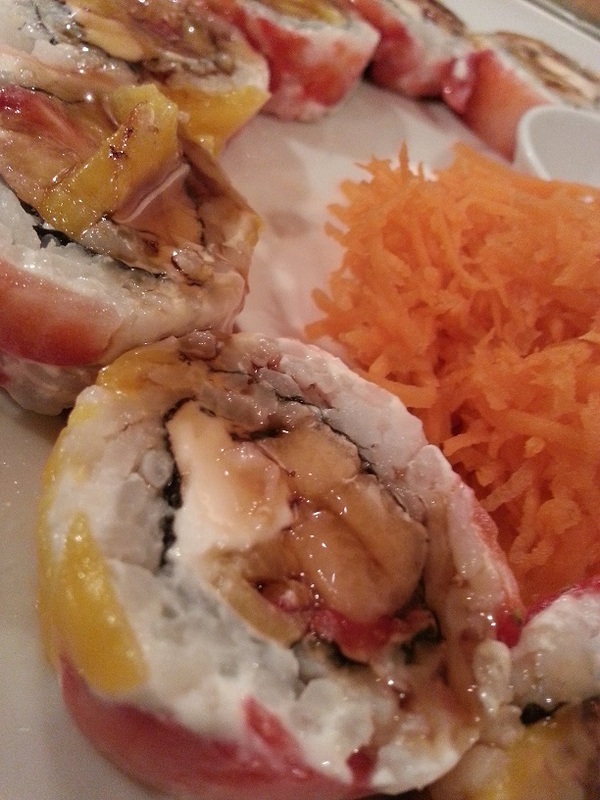 The highlight for me was the fruit sushi. It sounds strange, I know… but it was delicious! Really fresh (as in so fresh that I saw the chef making it from scratch),with banana, papaya and philly cheese rolled on the inside and thinly sliced strawberry and mango on the outside. So, so good. If you’re in Comitan, Mexico, go to this restaurant: http://www.facebook.com/restaurante.la.casita. This entry was posted in Mexico and tagged food, shopping. Bookmark the permalink.